My first few weeks in Dong Ha, Quang Tri, Vietnam have proven to be packed with meetings, proposals, friendly greetings from locals, the interviewing of 69 mine clearance candidates including our first ever female recruits, meeting with US secretaries to the Senate and Congress, visits to local schools, and to families who have been affected by Agent Orange, the development of a fitness program for female clearance operators, trips to the local markets, night clubs and restaurants and invitations to many local homes. Needless to say it has been very busy and left me with just enough time to a full 7 hours of sleep each night. I’m really excited because I know this is just the tip of the ice berg. 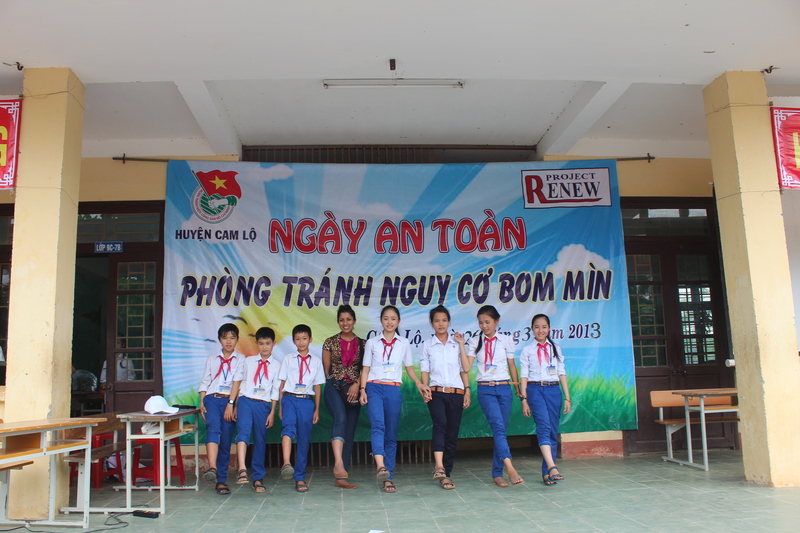 RENEW’s main office is always bustling with visits from clearance team members, government officials and as staff we are constantly in and out of the office doing outreach activities and sometimes breaking for some well deserved ‘Viet’ pressed coffee, locally called café Dan. I thought I would have a hard time adjusting, especially because of the language barrier, but I’ve learned that there really is a universal language because I haven’t had a hard time communicating with anyone. The staff at work has been so good to me. Every day at lunch I head out with Thuy for some amazing local cuisine, seriously… I have not eaten the same thing twice. After lunch we usually grab a coffee and a good conversation, and then head back to work alert and ready to tackle the rest of the day. The staff at my hotel has been super helpful and great Vietnamese teachers; we often exchange snacks and hang out in the lobby before heading to work in the morning, trying to discuss the upcoming events of our day with each other…sometimes successfully, other times not so much. I’ve finally found an accommodation this week, and I’ll be sad to say goodbye to my new friends at the hotel. It’s amazing to see how well our team works with each other and how quickly we can get things done when deadlines are looming. Despite the hard work, throughout the day you can hear laughter from some corner of the office if not your own, and everyone is full of hidden talents. The driver, Mr.Ha, is a professional ballroom dancer who I will commence lessons with this evening. There are a few members on the clearance teams whose voices sound as smooth as silk (one of them actually sang at the interview! ), and we’ve got a few jokers around the office who you’d never believe have a silly side. I’m not going to lie…the first four days I would wake up and promise myself I wouldn’t cry, but as soon as I heard the voice of my nephew, mother or husband the floodgates would open until I’d tell myself to ‘man up’, wipe off my face, take a deep breath, open my room door, and walk to work (which never happens because someone always sees me and gives me a ride). After those few days of silly tears, I truly felt the warmth of my staff and saw the impact of RENEW’s work in Dong Ha…all silly sadness dissipated. I am truly grateful for my time here, I learn at least 10 new things everyday and I truly feel right at home.